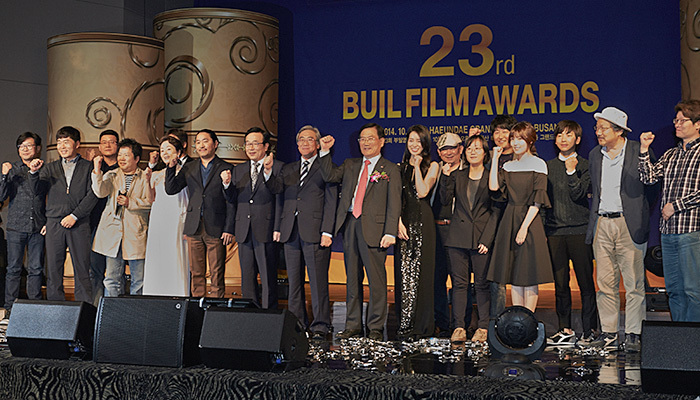 Yesterday, on the second evening of the Busan International Film Festival, the Buil Film Awards took place at 5pm in the Haeundae Grand hotel’s Ballroom. The moderators for the evening were actors GWON Yool and RYU Hyun-kyung. The winners of the previous year came along with a few other actors and filmmakers to attend and celebrate the evening. Here are the winners to the awards. In the Arts Direction, JANG Choon-sup of Roaring Currents took the trophy for this category. Director YANG Woo-suk announced the winning title, Kundo: Age of the Rampant and CHO Young-wook for the Music category, who also was nominated for Hide and Seek but unfortunately could not attend the occasion. KIM Bo-sung who has recently seen much popularity due to his buzzword “eui-ree” (loyalty) also joined the evening and presented the award for Best Cinematography to KIM Tae-sung who worked on Roaring Currents. For Best Script, SHIN Yeon-shick’s The Russian Novel took the trophy. Last year’s New Actor and New Actress winners JUNG Eun-chae and KIM Joon-gu stepped up to the stage to award this year’s rising stars. Among four other actresses, Obsessed actress LIM Ji-yeon took the title. On the young actors’ side, Shuttlecock’s LEE Ju-seung was awarded. While the New Director award was presented to the Cannes filmmaker, July JUNG for her film A Girl at My Door, Supporting Actress went to KIM Young-ae of The Attorney and Supporting Actor also to another The Attorney cast, KWAK Do-won who made the audiences cheer with his hearty laughter. Finally the Best Actress award presented by director PARK Chan-wook (Oldboy) and last year’s winner HAN Hyo-joo (Cold Eyes) went to SHIM Eun-kyoung for Miss Granny. Among the nominations there were BAE Doo-na (A Girl at My Door), JEON Do-yeon (Way Back Home), JUNG Yu-mi (Our Sunhi) and CHUN Woo-hee (HAN Gong-ju). SHIM expressed her gratefulness towards the crowd. Best Actor went to The Attorney star SONG Kang-ho who was awarded by HWANG Jung-min (Man in Love) and KANG Soo-yeon (Come, Come, Come Upward). Other nominees were CHOI Min-shik of Roaring Currents, LEE Sun-kyun of A Hard Day, SON Hyun-ju of Hide and Seek and PARK Hae-il of Gyeongju. The Best Director went to the Korean auteur HONG Sang-soo with his film Our Sunhi. Among the list there was Gyeongju, Roaring Currents, HAN Gong-ju, The Attorney, and Manshin: Ten Thousand Spirits. The all-time domestic box office number #1, Roaring Currents took the Best Film Award. Director KIM Han-min was very happy and expressed his thanks. As the film had the biggest budget last year, there were a lot of pressure on director KIM but the end results have been satisfactory. Among other events throughout the evening, there were four shows including new k-pop group Smile G and The One who lighted up the stage with music and dances. In addition, special awards were presented to director KIM Dong-won for YU Hyun-mok Film Arts Award in recognition of supporting art films, and the Buil Readers’ Jury Award to The Attorney’s YANG Woo-suk. YANG mentioned that the award is more meaningful in that the film was shot in Busan and it received the award in Busan which was voted by Busan audiences. The Buil Film Awards has been a signature award ceremony that has recognized quality Korean films and their filmmakers.